And here’s the revelation. The left over liquid is, guess what? Buttermilk!!!! So don’t throw it away because we are using it for our pancakes later. 2. At first it will look like chantilly cream you’d use for cake decorating. Continue whisking. 3. A while later it’ll start to curdle (looking like cottage cheese). Soon after, it will start oozing liquid. 4. Whisk until it has broken in to two components, solid & liquid. The solid is very fresh butter & liquid, buttermilk. 5. Collect the buttermilk for later use. Then whip the butter more to extract as much liquid. 6. 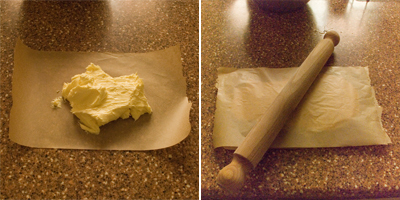 Weigh how heavy your lump of butter is, and calculate how much salt you’d like to incorporate. 7. Vigorously work in the salt to the butter to ensure even distribution. The double cream has to be fresh, not UHT or vegetable oil substitute. Some recipes will say to ‘wash the butter’ at the end. 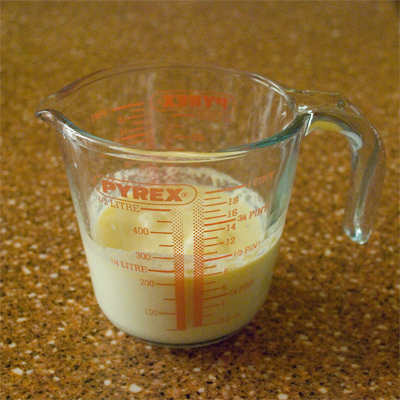 It is done to wash out any residual buttermilk so that the butter keeps for longer. I have skipped this step because it’s an extra work that takes the fun away, but please feel free to do so. Make sure to salt the butter AFTER you have collected the buttermilk. You wouldn’t want to flavour the buttermilk right? Butter yield: From 600ml of double cream, I ended up with 324g of butter & 235ml of buttermilk. This butter has a ‘cleaner’ note to the taste than shop-bought ones. And perhaps less yellow. The science: Cream contains tiny globules of butterfat surrounded by membranes. By agitating the cream by whipping, the membranes of these globules break & the loosened butterfat chain together to form a solid mass = butter. For more information, please check out this website. Next, let’s make some fun looking pancakes! In the recipe below, I have used silicone egg rings to make shapely pancakes. And also had some fun drawing on them. Ofcourse, you can approach this the usual/ easier/ quicker way by just freehand scooping & pouring! – And as for the recipe itself, it produces very moist pancakes that is very (very) moreish, I can assure you it’ll disappear from your plate in nooooo time… Ever since I made this recipe, we always have buttermilk in our fridge for a quick fix up! – – a: sifted dry ingredients: flour, baking powder & baking soda. – – b: mixed wet ingredients: egg, buttermilk, vanilla extract, but minus the melted salted butter which we will incorporate in step 3. 2. Make a well in the middle of the dry ingredients & GRADUALLY pour in the wet ingredients, whisking all the time. 3. When you have whisked the batter until it is not clumpy, pour in the melted butter & whisk it in. 4. Next, pour some of the mixture in another small bowl, then add cocoa powder to colour it brown. 5. Put the cocoa batter in a piping bag. 6. Heat the pan on low. 8. Place the silicone egg ring on the pan. 9. Pipe a simple design quickly using your cocoa batter. 10. When the cocoa design has dried, pour the pancake batter in the egg-ring (…here, make sure it is just under half the height of your mold, as anything higher, the batter will flood out when frying). 11. Place the lid on (…a glass lid would be best so that you can keep an eye on how the pancakes are doing). 12. Wait until you start to see bubbles appear on the surface & the edges slightly cooked. 13. Flip the pancake with the egg-ring still attached (…I find that flipping together with the mold ‘spill-free’). 14. Fry until it browns (about under a minute). This recipe does not work with milk as substitute for buttermilk. I tried & it came out edible, but not nearly as tasty as the proper buttermilk version. – I also did a test-run with milk that has been soured with lemon. It was much better than the ‘milk-only’ version, but nothing beats the real thing. If you are using the silicone mold straight again, just give it a quick wipe with the kitchen towel to get rid of any residue. – Baking powder reacts to moisture & enlarges the carbon dioxide (air) within the batter. It expands upwards. – As for the baking soda, which expands sideways, primarily reacts with acidic components (such as buttermilk) to give off carbon dioxide that expand under temperature. For both agents, the reaction is immediate after being incorporated, so please don’t rest the batter or the carbon dioxide will start to dissipate, & it won’t rise so well. – Another point worth mentioning about these leavening agents is that you should not use aged stuff that’s been lying around in your store cupboard, as it won’t be as reactive, it’ll have a bitter taste, & you’d get a disappointing result. I like using salted butter for this recipe. Salt is known for enhancing the flavours of the other ingredients, especially sweetness. I also like to grease the pan with the salted butter. Silicone molds are the best. I tried metallic shapes such as standard cookie cutters, greasing the sides with butter then flouring, but the pancake sticks now & again & it does not give you consistent results. Also, complicated shapes should be avoided as they are finickity. 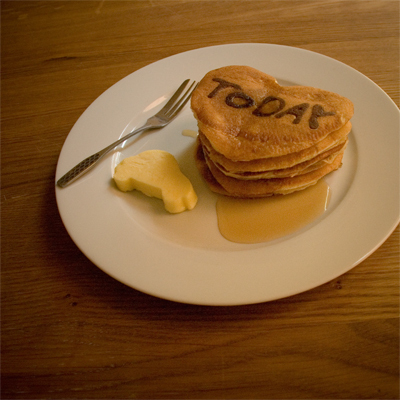 This one is an evolving message on a pancake as they eat! The surprise is right at the bottom! And there’s the three bears: . 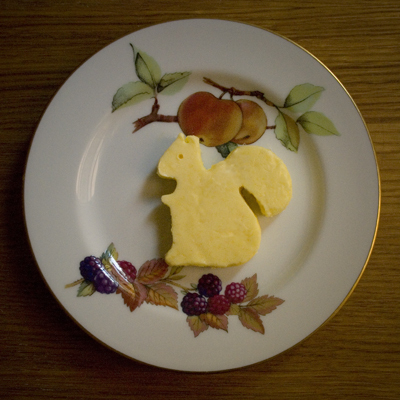 This one, I used my stencil to dust a bit of icing. .
And finally, a picture of a squirrel butter, which ends my longest ever recipe post!!!! Honey Boy, sorry to hear I didn’t get to meet you…!! I don’t know where you are from, but I hope that one day you’ll make the trip to London happen!! I’m always looking for pancake recipes, thanks for sharing this one! I generally love all batters made with buttermilk. And your creativity when it comes to fun is amazing: the Legoland surprise one made me want to come out with a grown up version right now! I too find that homemade butter is incredibly good and rewarding to make. Did you try baking with it? I have a feeling that it contains more water than the store bought one, and always used it only as a condiment. Boy your children must have been delighted both by the form and the content of the message! The butter looks delicious. I too was always put off by the idea of “washing” the butter, glad it’s not a requirement. Thanks for explaining the butter-making process in such detail — I love how thorough your recipes always are. 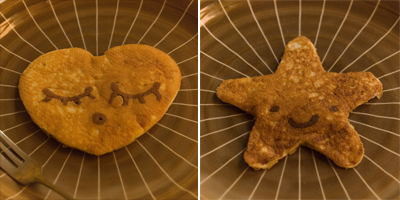 As for the evolving pancake message, it’s too adorable for words. Who knew butter was so easy to make?! thanks so much i will definitely give this a go. 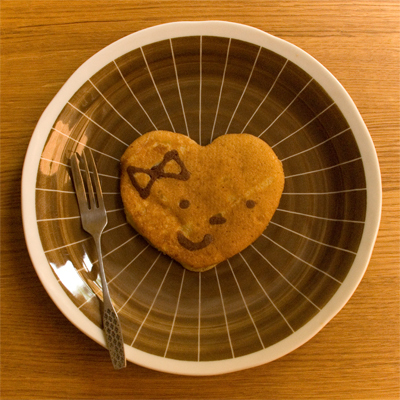 and those pancake messages so cute….those are lucky little kiddies you have! Caffettiera, I’ll be very curious to know what kind of grown up sentence you are thinking of!! (… or is it too naughty to mention here?! giggle!) As for baking with it – not yet, I’m like you, I’ve been using it as is – particularly spread THICKLY on hot toast…!! Astrid! How wonderful to hear from you again! The ‘visual explainer’ sounds amazing! – RE: washing, I find that taste-wise it doesn’t make a slightest difference anyways! And, the butter keeps for relatively long time because it is salted. Clotilde, thank you my darling. 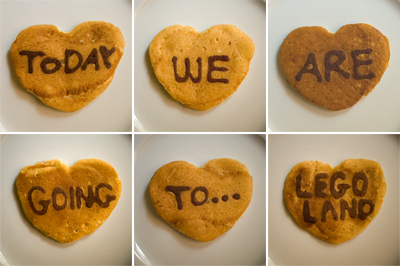 Whereas I find YOUR blog adorable!!! Anna, I KNOW!! When I initially found that fact, I was stupefied! – When you try, I’d suggest your fave loaf of bread in your shopping list too, to slice/ toast & generously spread the butter on!! Enjoy!! The Squirrel is really a lovely pattern, and hearts-cake too. Your blog’s marvellous ! I can’t tell you how much I love this post Tamami-san, totally cute overload! You remind me that once as a child I made butter by accident when whipping cream, and have inspired me to do that once again. Not to mention the lovely pancakes. I agree with Clotilde, your recipes are so detailed..Thank you for taking so much time to share them with us. I’ll look forward to seeing you one day! And thank you Heidy! I’m glad you like my writing style!! Happy butter making!! also looking for pancake recipes as it’s surprising how many poor recipes are out here! thanks. the first time i ‘made’ butter it was a total accident–whipped the cream just a hair too long ;) having a kitchen blowtorch brings a smile to my face, but scares my daughter…. This was fun to read too. The kids must have been so excited! Have you ever thought of including Jap pastries at the market, or perhaps some fusion Jap-Western flavours? Angela G B, adoption won’t be an option, but why don’t we make things easier & I just make you some pancakes next time you come to play! Petoskystone, well, I hope you like this recipe then! And I totally know what you mean by kitchen torch bringing you out in smiles…! Me too… but why is your daughter scared of it? Bad experience? Hi Tommy, yeah, what’s good (or bad for teeth) about this is that they got to eat LOADS of pancakes while I was experimenting with the recipe!! Tian, no probs! And as for Japanese influenced pastries, no…, mainly because the ingredients such as imported matcha powder is v. expensive. Also because from experience, I think that market-goers tend to buy foods that they are familiar with. Ann, it was so lovely to meet you too!! And thank you for your kind words about the brownies & especially about the gooseberry cupcake – it’s a new product that I am testing… Good luck with the cafe/ cake shop Ann!!!!!! Technically, the leftover liquid isn’t really buttermilk, though. 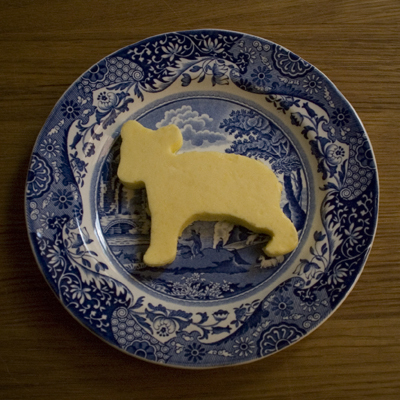 Traditionally, butter (at least in some countries – the tradition varies) was made from soured cream. The cream was made into butter, and then the leftover milk would also be “sour” – hence the yoghurty taste of buttermilk when you buy it in shops. owadays, they don’t make it like that in the industry anymore, and buttermilk in cartons is just a soured milk product and no longer has anything to do with butter. “real” buttermilk is harder to find(at least in Danish supermarkets). Recipes which require buttermilk usually take advantage of the acidity of the liquid to react with baking soda for rising. I just wanted to clarify – this buttermilk won’t do anything for the rise, just for the taste :) It all looks delicious, though! Hello Anja, thank you for your valuable input! They all refer to the leftover liquid as buttermilk. And the acidity of this buttermilk will indeed help the rise, reacting with baking soda! I think that the buttermilk referred to as traditional in the first wikipedia article is the result of making butter from fermented cream. I have never tried this, I have only made butter from fresh cream (in school, years ago). All liquid left over after making butter is probably buttermilk, but the tart product that the untraditional buttermilk is recreating is the buttermilk from fermented cream, I imagine. Which would make three types of buttermilk, of which only two have the acidity from culturing? Anyway, isn’t milk slightly acidic in any case? Which would explain the rise (which again would probably be stronger using a fermented product)? Thanks Tamami for liking the trellis, will make sure he comes to see u, he loves baked treats! Thanks Bindiya! I’ll look forward to it! This is my first to visit here, and I really love it. You provide every step of your works clearly. I think I will definitely get lots from your blogger. Thank you Yaping!! Hope to hear from you again then!!!! I have visited your blogger for more than ten times. The more I read it, the more I like. I am from Taiwan. Really nice to meet you here. Besides, I am really looking forward to hearing your new posts. this is the perfect way to wake up in the morning. thanks, tamami! I know you’re jap but maybe u can read kanji? it means breakfast w love!.. haha.. took the pic and send to my friends on my blackberry and got lotsa ooh and aahs… haha felt so happy given the recipe was so simple! I love your blog and now it loads automatically when I open my browser.. i was looking forward to your report from the Craftacular event. So sorry u did not sellout your croissants n smoothie n congrats on ur lemonade! 爱心早餐… what a lovely lovely word. How do you pronounce it? Desserts made with happiness & love… ahhhh…. It’s bound to taste great! And thank you for your feedback on the recipe – it means a lot to me these feedbacks! 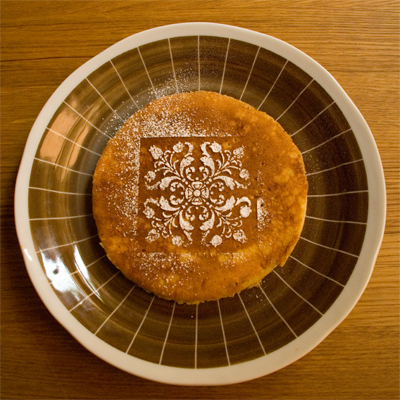 Good luck with the cheese cake too – remember it tastes better the next day…! So hands off for the night, okay!? am in Phuket for a relaxing holi… but will get going with the cheesecake once I get home in Spore… and yes m’am hands off one night!! Marie, thank you for getting back to me about the mandarin way to say it. “Ai xin zhao chan”… I’m going to remember it. 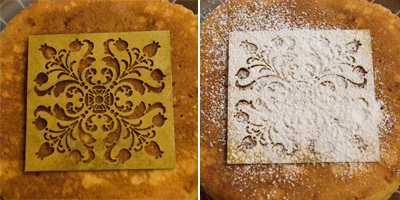 This guide is brilliant, the photography at different stages was a nice change and I loved the idea of dusting a pattern onto pancakes with a stencil. Nice touch. If I’m feeling generous my girlfriend might get some one morning! I am a longtime reader of your blog. Do you mind if I borrow some photos from this blog post? I am currently creating a how-to flash movie for my portfolio, and I thought of your blog. I hope you don’t mind. You are such an inspiration! I wish I could go to London and meet you! :) cheers! Hello Marge, thank you for asking! I very much appreciate that. Yes!, you can use the images – but if you don’t mind, only for your portfolio – & that it doesn’t get published to the public. Sorry to be a pain, but I’d like to draw the line there… (I’m a control freak…!) Hope you understand! Hello! I was wondering if you could tell me where you get your stencils. The one above is gorgeous, and I am looking for a nice one to decorate a birthday cake. Thank you :). Thank you for the ping back! I have to say, I never tried it for this, but I guess it’s always worth a try!